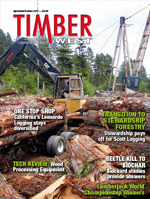 Timberland availability and a new regulatory environment are working in Scott Logging’s favor, and the company is finding more opportunities in the woods. For a lot of Northwest loggers, the last few years have been mighty tough to get through. 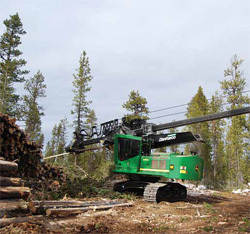 For Ron Scott and his sons, Brad and Russ, of Scott Logging in La Pine, Ore., the changing nature of available timberlands, combined with the new regulatory environment, has actually worked out to be something of a benefit to their business (now entering its 60th year). Of course there have been some adjustments to make. The stands they harvest are now typically populated by younger, smaller diameter trees, and they often have to drive an hour and a half (or more) to get to the job site. But once they get out into the brush, they find they are now getting paid for things they used to do for no extra cost as part of the bid package. Plus they now have many more opportunities to make money aside from the traditional deal of chop down a bunch of trees and haul them to the mill. By separating the road construction and cleanup work from the actual cutting and hauling work, logging operations are forced to think more clearly about what exact costs are involved for each activity. That’s not to say that loggers didn’t take a good look at their costs in the past, but with these new procedures, it’s not as easy to assume that an added expense in one area — say road building and maintenance — will be covered by additional income from the actual logging. All costs need to be and identified and examined closely. 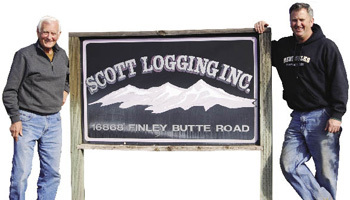 Scott Logging is competing with six to eight companies for many of the jobs. Ron Scott believes it’s the quality of their work that makes them stand out. It also means that the logger must either invest in the equipment to do the mowing, or he has to subcontract it out, which is what Ron does. Most of the timber sales Scott Logging bids on are in the 2 mbf range, and they tend to stay booked out at least a year to a year and a half in advance. Most Forest Service jobs in eastern Oregon focus on thinning to reduce fire hazard. Additionally, because the Forest Service is contracting for road building and slash cleanup with separate work orders, guys like Ron have more opportunities to keep their crews busy year-round. “The thing about stewardship bids with the Forest Service is that they are not necessarily looking for the lowest bid on each project,” he says. From his perspective, the key to winning these jobs is to provide reliable and consistent quality from job to job.